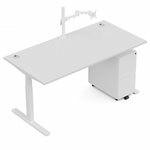 Back problems can be caused by prolonged periods of sitting, to combat this the Mobility range offers Height Adjustable desks that allow the user to stand while working. 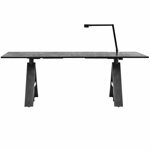 The range offers a combination of different solutions in both manual and electronic height adjustment for single and double tables.Mobility Pro is a paired down budget version of the Mobility Plus system. Choice of T or Straight legs in Aluminium with silver, white or black finish.